What Kind of Paint Covers Nicotine-Stained Ceilings? Most coatings don't do a good job of covering nicotine or other smoke stains on your ceilings. If you apply a coat of ordinary white ceiling paint, the stain will continue to bleed through -- and even a second coat may not hide it. For best results, start your painting job like the pros do -- with a stain-killing primer. Man using a roller to paint a ceiling. Stain-killing primers are available in latex, oil-based and shellac formulas. To cover smoke stains, the primer must not only cover, but also seal, the nicotine stain. Unless the stain is relatively light, most latex primers show some bleed-through after a single coat, while primers that are specially formulated to hide stains do slightly better. The best choice for covering nicotine stains in a single coat is a white-pigmented shellac primer. Can I Paint a Smoke Detector? 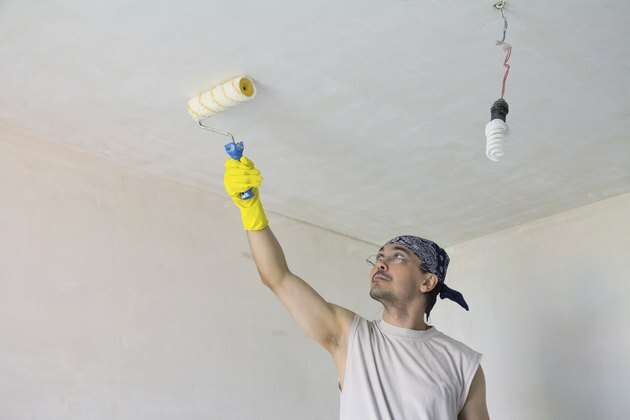 What Makes Yellow Ceiling Stains?